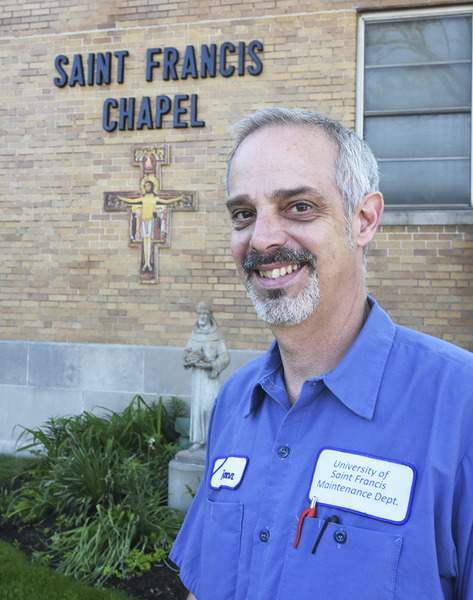 Cathie Rowand | The Journal Gazette Ramon DeMond, maintenance and repair technician at the University of Saint Francis, works behind the scenes to keep facilities up to date and functioning properly. He's been with the university for 15 years. Officially, Ramon DeMond is a maintenance technician at the University of Saint Francis, but it didn't take him long to earn an informal moniker. Upon meeting him, people on campus would say, “Oh, so you're the key guy,” DeMond said, explaining he took over for the previous person in charge of keys. Along with pinning locks and providing keys to students and staff, DeMond designed and implemented the key system on campus, which has grown from about two dozen buildings to about three dozen in his 15 years with Saint Francis. Multiple lock systems were used when DeMond arrived, he said; adding the standardization simplifies his work. “The management of USF's key acquisition system is truly 'behind the scenes,' but Ramon provides a personal and professional touch with every encounter,” Teresa Sordelet, vice president for administration, wrote in an email. Trinity Hall along Spring Street is home to the key shop, but DeMond's varied responsibilities take him across campus, including the university's buildings downtown. During summers, DeMond and his co-workers prepare residence halls for students in the fall, a process that takes about three weeks. The tasks include “a lot of painting and patching” as well as fixing anything loose or broken, he said. Items needing attention include “a lot of little things,” such as shower rods, blinds, doors, plumbing and cabinets. Maintaining the 15 campus vehicles is also DeMond's responsibility. He handles basic repairs, such as replacing turn signal bulbs and wiper blades, and schedules service appointments for other needs. Sometimes, teamwork is required. In 2015, for example, the university recognized DeMond and another operations employee on social media for installing an outdoor San Damiano cross on the renovated entrance to the St. Francis Chapel. “The bigger projects we all work together on,” DeMond said, recounting a remodel involving demolition work. DeMond has enjoyed hands-on work since childhood. He got an informal education from maintenance staff at a Christian camp and from his grandfather, who ran a lake resort in Michigan. “He always had projects,” DeMond said. DeMond came to Saint Francis after working 15 years in hotels, whose temporary clientele made the nature of the job more demanding. “I just needed a change of pace,” he said.